I stopped playing Animal Crossing: New Leaf on May 5, 2014. 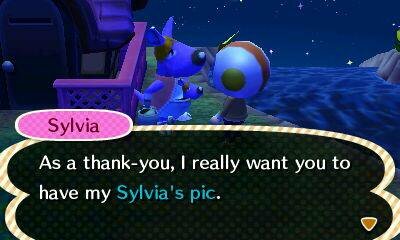 That’s two days after my favorite villager Sylvia’s birthday. I missed her party. I meant to go all out and get her every gorgeous, pink item I could find, wrapping each up in special paper to make her day all the more memorable. Instead, I blanked and didn’t even show. With panicky fingers, I visited her only to discover her entire home in boxes, ready to be picked up and moved by a service of muscles. She was leaving me. I tried my everything to convince her to stay, but it was too late–she was unmovable. Or rather, completely movable. It was hard to step away from Animal Crossing: New Leaf, a game which still to this day sits at the top of my Nintendo 3DS stats as my most played game, with only a few others creeping near it. And yet, Sylvia’s departure from my town, as well as her finally giving in and presenting me with her portrait only a few weeks before, unfolded right around the time my marriage was concluding. Two lives ending in unison, and me, standing still, scared and uncertain of what I could do. Thankfully, to help ease the nights, another game swooped in and stole all my attention. Well, Happy Home Designer is not another full-blown Animal Crossing title, and that’s fine. I’m not ready to commit once more. Instead, it takes elements from the main series, specifically the home decoration aspect, and expands it into a full-time job for your character, who is no longer mayor of the town, but once again another employee of that nefarious rascal Tom Nook. As the newest designer at Nook’s Homes, you’re given the power to create homes, yards, and other buildings, inside and out, with the main goal of making your animal client friends happy. You can help out one client or building request from Isabelle per day–that’s in-game per day, not real life–and before you call it a night, you can spend Play Coins to study your handbook and acquire new blueprints, items, and other decorative thingies for future use. For some people, decorating is not the siren’s call of the Animal Crossing series. They might prefer fishing and collecting bugs, selling beetles from the tropical island for a large amount of Bells, or doing all the community requests around your village. Or perhaps you really got into designing outfits. There’s also working at the cafe. I think the great thing about Animal Crossing is that it is wide open, and you can love what you love and go deep on it without completely pushing everything else out of the way. For instance, when my sister Jules was playing, she made a great effort to breed all the rarer flowers and enforced a strict “no running” rule when I’d visit her town. For myself, I really enjoyed expanding and decorating my home, both in Animal Crossing: Wild World and Animal Crossing: New Leaf. I’ve gone to great strides to get rare furniture before. For the most part, I’d pick a theme for a room and work towards collecting items that were either officially part of the theme, like astro furniture only, or somehow related, like a meteor or toy rocketship to place in the corner. The struggle sometimes was finding all the pieces of furniture, which relied on the daily luck of the shop, the generosity of your neighbors, and whether or not you had a friend who could visit and dump everything you need at your tiny, pointy feet. Thankfully, Happy Home Designer gives you a large amount of the furniture objects to you right from the get-go, so you can attack your client’s house with all you have and not be restrained by things like missing lamps or using a chair that obviously clashes with the aesthetic. Or, if you want, and this is something I don’t ever want, you can go against your client’s wishes and run amok in terms of design and feng shui. For instance, say a squirrel wants a forest-themed house, but you decide to fill it up with pink princess furniture, robots, and all things not related to the forest. As far as I can tell, the job will still get done, and the client might be okay with it. There doesn’t seem to be any penalty for going outside the box, but I prefer to accomplish what the buyer is paying for. I mean, you’ll still get something to eat if you order a hot dog and get a hamburger instead, but that doesn’t mean you’re one hundred percent satisfied with the course of action. I’ll never stop moaning and groaning over the severe lack of Play Coin integration during the lifetime of the Nintendo 3DS, but the Animal Crossing series has at least tried here and there. In this one, before you clock out for the day and count some sheep that hopefully look nothing like Pietro, you can spend Play Coins, ranging from one to five (so far), to upgrade your decorating abilities and the items available to you, as well as other functions. Like, now I can change my avatar’s skin tone and hairstyle in the boutique section upstairs at Nook’s Homes. Also, I have every gyroid possible, simply at a fingertip’s reach. Same with famous pieces of art. Now, you’ll recall I had a bad case of epic fail last time I went to GameStop. Well, seems like there was still some in my system when I went to purchase Happy Home Designer with a Christmas gift card. Speaking of cards, there are special amiibo cards for this game that allow you to personally invite celebrities like Tortimer and DJ KK to Main Street and help construct a home for them. Since I have a regular ol’ launch Nintendo 3DS, I asked the young man behind the counter if the amiibo cards would still work or if they only worked on the New Nintendo 3DS, which remains a terrible name to this day. I mean, there’s only one copy of the game, and the game itself comes with a card, so I hoped they would work no matter where you ended up playing it. The GameStop employee told me they would work. Got home, played for a bit, unlocked the amiibo phone, and nope–they do not. I’d have to buy some sort of electronic reader for $19.99 to get them to work, and I already spent enough money on the game and cards themselves that I’m annoyed by the whole process, so forget it. I’m not playing Happy Home Designer every day like I did for Animal Crossing: New Leaf when I first got it and then for many, many months thereafter. Instead, I’m chipping away at it, doing a client’s request or a job from Isabelle, and then calling it a night. That’s fine. It’s a leisurely game about making animals happy, and making animals happy makes me happy, so this is how I get my fix when needed. However, I am curious to know how long this whole business plan lasts because, eventually, I will run out of clients and things to do. GameStop’s PowerUp Reward points are stupid. Or maybe I’m stupid. Certainly one of us is to blame, and, as a human stuffed with ridiculous emotions like pride and shame and deep-seated embarrassment, I’m inclined to place the fault on someone other than myself. So there. Well, no…let me explain more. Trust me, this story will eventually lead to both the reason why this blog post is about Puzzle & Dragons: Super Mario Bros. Edition and my early impressions on it, up to the end of World 1. See, I recently noticed I had a ton of “points” in my PowerUp Rewards account, seeing as I’ve bought a number of things over the last few months, like an Xbox One, and decided to cash some of these points in for a single $25.00 redeemable coupon. In my mind, I was planning on burning this to buy four more amiibo card packs for Animal Crossing: Happy Home Designer because I’m broken inside. No, really, I am. Utterly and completely damaged. Animal Crossing is one of my all-time favorite series, and now there are collectible cards out there that one can collect and caress and cherish until the end of time. Insert that Futurama meme hard as heck right here. Anyways, this did not work out. Evidently, the $25 coupon can only be applied to a single item, not your final bill. 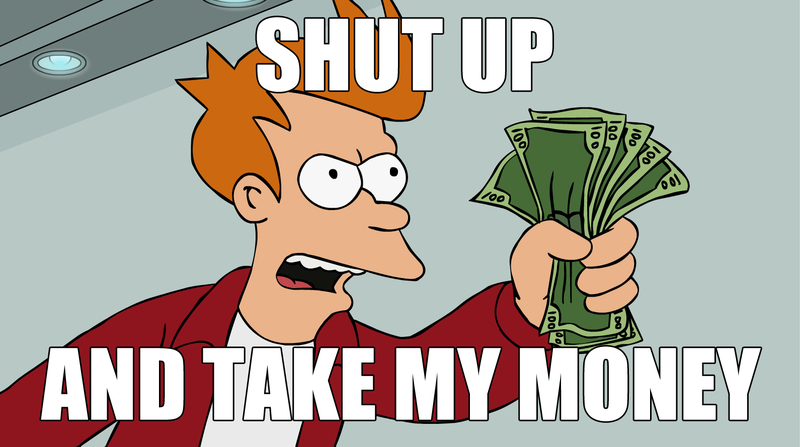 Sure, that means I could waste it all on one $5.99 pack of amiibo cards, but I wouldn’t get any of that leftover credit. It would just vanish. Seems both like a waste of points and effort. So, instead, I looked around the store for something that was more than $25.00, and so a new copy of Puzzle & Dragons: Super Mario Bros. Edition for $30.00. Fine. I mean, after all, it was a game I wanted to play last year, but did not get to. Still, that $25.00 credit coupon is beyond misleading, and, unfortunately, it seemed like there was no way for me to return to the points to my account; doing that would have allowed me to at least create two $10.00 credit coupons, and thus two more amiibo card packs. Oh well–lesson stupidly learned. Anyways, Puzzle & Dragons: Super Mario Bros. Edition takes the super popular in Japan free-to-play mobile model of Puzzle & Dragons and coats it in a cutesy, colorful Nintendo skin. I say that as if I know anything about Puzzle & Dragons vanilla, which I don’t. I’ll do my best now to explain it in mechanical terms. Gameplay revolves around matching three or more orbs of the same color/element by displacing one orb around the board to attack enemies. Each turn you conduct counts down as a timer for the monsters to attack your party. The goal is to complete the dungeon/level you enter by defeating every foe and surviving until the end. Also, skilled players can create chained combos for massive damage in a single turn. I’ve only gone through the first world, which obviously loads up some tutorial stuff, but it’s pretty fun. Creating those big combos feels so dang good; also, missing those combos hurts more than I can explain. It’s not as simple as moving one orb over to another like in Pokemon Shuffle or Frozen Free Fall, since sliding the orb around the field affects other orbs in its path, and I don’t have the best handle on how this actually works. Plus, you’re timed. It can be a bit stressful, but truly satisfying too. Sometimes I score big, and sometimes my party of goombas and red winged turtles simply sit there, frozen in regret, bracing for the worst. There’s actually a lot of options for you from early on to help build up a strong, capable team that will help you rescue Princess Peach from Bowser. Oh, did I not mention that she is kidnapped again? Good job, Nintendo. Really stretching those creativity muscles. Basically, you can sacrifice weaker teams members you aren’t using to power up a single team member. There are also items to find to help with this, as well as lot of experience points to earn along the way. Right now, I have three separate teams created, all of which have their strengths and weaknesses. Knowing what those are and picking a compatible leader is key to surviving some of the later fights, which deal out a ton of damage to your team if you don’t combo fast and early enough. There’s also a few grayed out options on the menu still to open up. I’ve not gotten to try Puzzle & Dragons Z yet, which is the other game packed in, but I suspect I will eventually. Want to continue on this path for now so that I’m not trying to juggle two sets of similar teams in my mind. I also have to imagine it’s the weaker of the two titles in this nifty 3DS bundle though I’m curious to see how they work in a JRPG story around all these orbs. We’ll see in due time.